More chicken curry meals in the slow cooker. This meal is actually a regular part of our family rotation. The list of meals that we have repeatedly is very short, given that we are always trying new recipes for the website. But this one has been on the list for a few years and will remain. Mainly because everyone at the table polishes their plate. It’s rare for that to happen in a family with 4 little people who have distinct preferences. Perhaps this will be your family’s new regular meal?! Give it a try! So I was chatting with my friend Christan about my Slow Cooker Maple Chicken recipe that I recently shared on $5 Dinners. She fixed it for her family and her girls (like my boys) couldn’t get enough. We got to talking about recipes and slow cookers at our last MOPS meeting and she told me about a very similar recipe that she makes…but it’s curry and not maple. It’s almost identical…swapping out the maple for coconut milk and curry powder. The rest of the ingredients and the cooking method are the same! If you open your coconut milk and it’s hard and white on the top, don’t fret. It’s natural for coconut milk to separate. Just spoon it all into the slow cooker and whisk it up until it’s creamy. 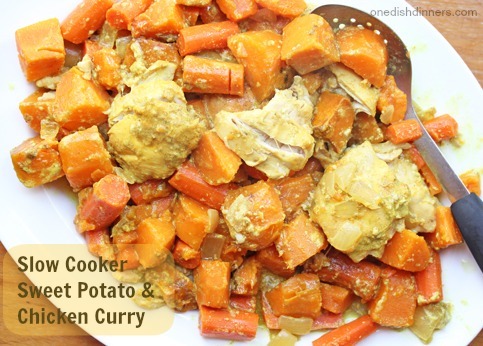 Whisk together the coconut milk and curry powder in the base of the slow cooker. Add the chicken thighs (or chicken breasts if you prefer), the sweet potatoes and carrots. Toss with the coconut milk. Sprinkle a little salt and pepper over the top. Prepare fresh fruit for side dish. 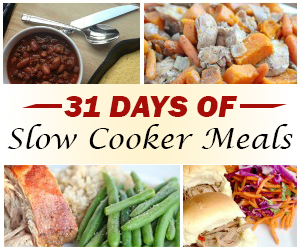 Serve Slow Cooker Sweet Potato and Chicken Curry with side of fresh fruit. I LOVE this one! Consider substituting frozen peas for the carrots to balance the colors and because peas are delicious in curry! We also found this a little bland, even added more curry powder to the 2nd freezer pack and we both like curry flavoring. Possibly too many sweet potatoes and carrots?